Sustainability efforts are often thought of in terms of the easy wins. Green Teams certainly do important things like encouraging employees to use both sides of paper, recycle more items, and make positive changes to the way they work. But Corporate Sustainability Collaborative member companies clearly envision a more ambitious view of what’s achievable. At our December 2018 quarterly meeting, everyone in attendance had a chance to share their workplace’s greatest sustainability success from the year, and some of what they shared goes far beyond resource conservation. December 2018’s quarterly meeting took advantage of Vestas’ stadium seating to accommodate a group of ambitious sustainability champions. We heard organizations like Vestas (which hosted the event) share their plan to have their building LEED Platinum re-certified, even under stricter criteria that exist now. We heard businesses like KINK-FM going carbon-neutral. Energy Trust of Oregon has a goal with its management team to go fully paperless. Other organizations like Heritage Bank, were going even bigger. Heritage Bank is instituting equity policies aimed at achieving equal pay for men and women. Elephants Deli and CLEAResult are actively centering equity in their purchasing, catering and vendor choices. Some of the more traditional sustainability projects members highlighted even had lofty end goals. The catering arm of Elephants Deli is working to eliminate specific items like Styrofoam or throwaway plastic tongs – aiming for a goal to remove all single-use (especially plastic) items from their operations. Businesses like Daimler and the Portland Trail Blazers took on the serious challenge of expanding employee engagement in sustainability beyond small groups of engaged employees. The Trail Blazers added a tour of their sustainability efforts into every new employee’s onboarding process. Daimler has recruited more than 300 employees into their Sustainability Club and started an Ambassadors program with the hope of engaging even more employees in environmental issues. Some of the most impressive projects were about doing things that sound simple at first, but require serious effort to stay the course. For example, the Trail Blazers organization helps people at their events recycle, but they also sort through EVERY bag of waste bound for the landfill to pull out compostable and recyclable materials before it leaves the building. Businesses always tell employees not to waste office supplies, but companies like The Standard went to the trouble of setting up a “Green House” to collect unused items for other co-workers to use. Many workplaces offer an electric car charging station and a few bike parking spots, but companies like Vestas are adding more car charging equipment to meet employee demand and offering in-office bike tune-ups twice a year. Every piece of paper saved, every kilowatt of electricity not needed, every gallon of gasoline not burned, every pound of “garbage” that was instead turned into compost or recycled into new items all make a difference. But real change clearly requires effort and dedication. The Corporate Sustainability Collaborative is incredibly proud of our member companies and the strides they are taking to address our biggest environmental and social challenges. We can’t wait to hear about these efforts and more at our next gathering in March 2019. The language of sustainability can seem like an alphabet soup of acronyms, making the very personal work we do feel rather impersonal. SDG. UN. GRI. SRS. Despite the jargon, these are acronyms that connect businesses back to one central goal – make the world a more just and secure place for all. 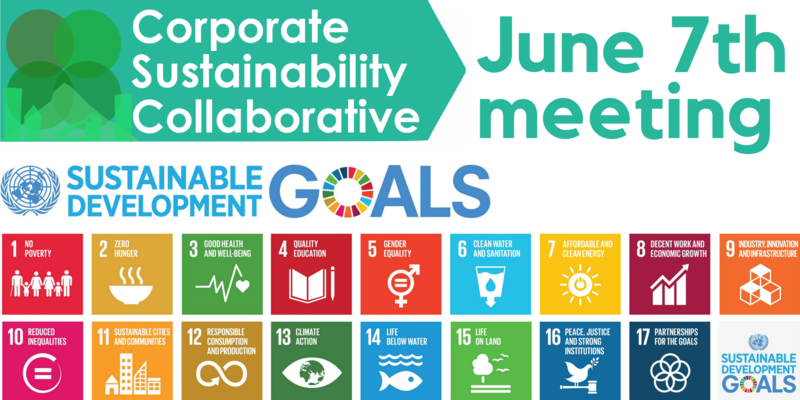 The Corporate Sustainability Collaborative (CSC, just to add one more acronym to the heap) hosted its Quarterly Meeting in early September, focusing on the United Nations Sustainable Development Goals (SDGs) and how businesses can make lofty goals like these important parts of a corporate responsibility program. Attend a second session of this workshop at the Oct. 10th GoGreen Portland conference. 30% off coupon code at the bottom of this post. 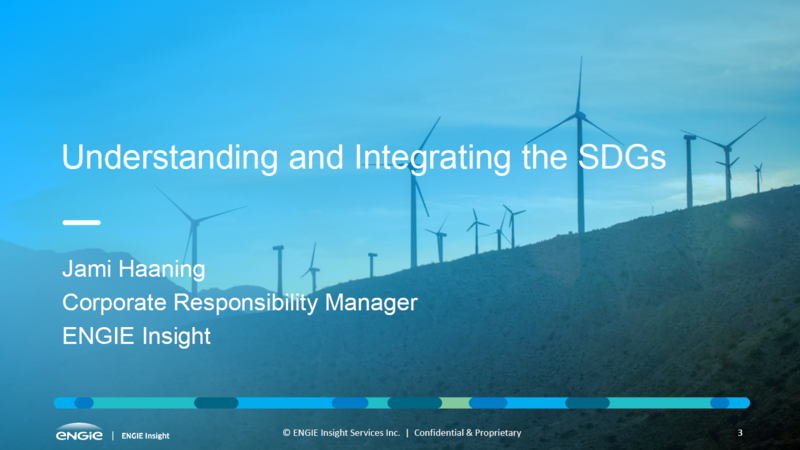 Jami Haaning from Engie Insight provided the initial overview of the SDGs and outlined ways in which businesses have worked key Goals into every aspect of their work – from raw materials to the end of life of a product or service. Her presentation, with specifics of how businesses can set their own goals, is available here. Donate employee time to volunteer with groups like Community Energy Project that install weather-stripping and plastic on the windows for older residents, or those with disabilities. For those able to do the work themselves, CEP provides training and supply kits. Encourage employees, friends and employers to offset energy usage through carbon offset programs for natural gas and electricity. This puts promotion and assurance of on-going biogas and wind projects into the hands of the people for relatively low cost. Smart Energy, Blue Sky and PGE’s offset options are programs Portland businesses can consider. In Portland, companies could promote employees getting a Home Energy Score by off-setting the cost and then interviewing these employees and featuring the learnings/experience in a company-wide communication forum. This makes the concepts of energy efficiency seem more relevant when your house gets an efficiency score. Use the power of your business with local / state / federal government to advocate for policies that advance sustainable cities. Sign on to coalitions of businesses working for equitable transportation, urban design, public spaces, or other urban livability improvements. Banks and investors can lend to projects with sustainable development goals and using sustainable technologies in their design or business operations. Update purchasing requirements to prefer products with reduced packaging and made from post-consumer recycled materials. Switch to reusable dishware in office kitchens / breakrooms and use catering companies that provide reusable dishware. For manufacturers, work on closed loop systems. Educate coworkers, friends and family members on sustainable consumption choices through programs like EcoChallenge. Many businesses are already using the Global Reporting Initiative (GRI)’s business indicators to track actions like these, and the SDGCompass.org website offers a handy list of key GRI Indicators for each Goal. To participate in a second presentation of this workshop, attend the Portland GoGreen conference on Oct. 10th – use the Corporate Sustainability Collaborative’s coupon code (CSC30) to get 30% off your registration. At our last meeting we learned about the United Nations’ Sustainable Development Goals (SDGs) and how they fit into the larger world of investing and reporting. We also heard how two local businesses, Portland Roasting and Portland Hawthorne Hostel, have used the SDGs to shape their sustainability goals and staff engagement. Where do you have influence? What are key takeaways you can implement? A $5 RSVP ticket is required to attend, to offset lunch and venue costs. Jami Haaning from Engie Insight shared a crucial tool for considering how to use the SDGs in your organization. Download her worksheets to consider questions that can help you find the right SDGs for your company. Join your sustainability colleagues for lunch to go beyond the basics of sustainability. Innovative businesses of all sizes are using the United Nations’ Sustainable Development Goals (SDGs) to plan and quantify their effect on the planet and our society. Mike Wallace, a Partner with ERM, a leading sustainability consultancy, will lead a session on SDGs. Jami Haaning from Engie Insight will facilitate group exercises to help you select the SDGs that align with your company. Note: A $5 paid ticket is required to attend, and all seats are currently sold. Put your name on the waitlist and we will contact you if space becomes available. This quarter’s meeting generously hosted by Ruby Receptionists, with lunch provided by Waste Connections. Whether you have a company employing several thousand people, or just a few folks, every business has some goals for being more efficient, using fewer resources, and saving money where they can. At the Corporate Sustainability Collaborative’s last meeting of 2017, participating companies gathered to share their biggest “wins” for 2017. Not coincidentally, most of their efforts had both sustainability and efficiency benefits. The Bonneville Power Administration focused on saving energy by making their data center more efficient. Widmer Brewing installed a CO2 recovery and re-use system in their brewing operations, becoming the first Oregon brewer to “close the CO2 loop”. Installing LED lights in their office. Purchasing an electric car and charging station for employees to use. Retiring an old energy-sucking computer server in favor of better cloud computing. Paying for emergency rides home for employees who bike or take public transportation to work. One company wants to organize their neighbors in their office building to collectively ask for sustainability improvements, difficult work when building management companies change often. Elemental Energy, through its own nonprofit organization, Twende Solar, is bringing renewable power to populations without access to power generation systems. Lloyd EcoDistrict is setting goals that would get the whole Lloyd District to producing zero waste, even with the many new offices and apartments being built now. Portland Pedal Power is expanding its sustainability metrics into the social impact sphere, tracking and making goals for how their business can have a positive impact on the region, not just their own bottom line. The sustainability professionals and organizations that make up the Corporate Sustainability Collaborative will be relying on one another throughout 2018 to share ideas, resources, and connections to turn their 2018 goals into next year’s “wins”. December’s Quarterly Meeting is a Happy Hour! Location: Widmer Brothers Pub, 955 North Russell St. Cost: $10, includes Widmer beer and hors d’oeuvres. *If the cost is prohibitive for you, let us know, we’ll make it work! At this meeting, we’ll spend time getting to know each other and sharing our own successes (and challenges) from the past year. Our featured presentation, by Lloyd EcoDistrict, showcases collaborative, sustainability-centered work with Right 2 Dream Too to provide needed resources to people living outdoors. We’ll also have more sustainability pros sharing their workplace’s 2017 sustainability, waste prevention, and employee engagement wins! Moda Health, Ruby Receptionists, and CLEAResult are just a few who will be sharing ideas you’ll be able to take back to your own office. Reserve your spot now — quarterly meetings usually sell out!